Are you looking for a career in the early childhood field? Child Australia has been delivering accredited training since 2014. We strongly believe that accredited courses should be delivered by highly experienced practitioners with hands-on current sector knowledge. Whether you’re just starting out and want to enrol in a Certificate III or you’re ready to upgrade to the Diploma, look no further because Child Australia can provide the training opportunities to get you on your way. Our qualifications are nationally recognised and reflect the roles of employees in a range of early childhood education settings who work within the requirements of the Education and Care Services National Regulations and the National Quality Standards. They support the implementation of an approved learning framework, and support children’s well-being, learning and development. Child Australia provide a flexible study program to suit employers, workplaces and allows students to work during the day. We place an emphasis on practical skill development, solid student understanding of performance criteria and relevance under NQF and conduct onsite visits with students to maintain momentum and accountability. We work closely with employers to ensure that our students are carefully guided and maximise their learning experience. Training will equip you with a set of solid pedagogical practices to set you up for a successful career, with consistent ongoing communication and tailored support from trainers giving you the confidence to be the best you can be. I’m looking to enrol in a course and would like more information. I’m an employer and I’d like to register my interest. This qualification is nationally recognised and can lead to a range of potential career opportunities including Childhood Educator Assistant, Outside School Hours Aide and Preschool Assistant. It reflects the role of workers in a range of early childhood education settings who work within the requirements of the Education and Care Services National Regulations and the National Quality Standard. They support the implementation of an approved learning framework, and support children’s wellbeing, learning and development. Depending on the setting, educators may work under direct supervision or autonomously. 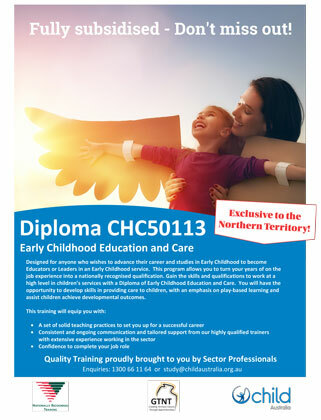 Designed for anyone who wishes to advance their career and studies in Early Childhood to become Educators or Leaders in an Early Childhood service. This program allows you to turn your years of on the job experience into a nationally recognised qualification. Gain the skills and qualifications to work at a high level in children’s services with a Diploma of Early Childhood Education and Care. You will have the opportunity to develop skills in providing care to children, with an emphasis on play-based learning and assist children achieve developmental outcomes. Please download the Enrolment Form and complete all sections and sign the declaration. Once completed simply scan and upload your Enrolment Form using the Talk To Us form below. Confirmation of your Enrolment will be emailed to you once complete. 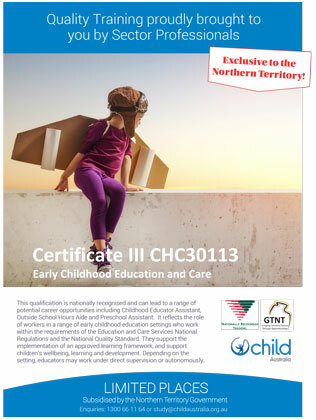 As recognised sector experts, Child Australia has partnered with a highly respected training organisation GTNT Training Plus to ensure that you receive the best possible learning experience. As a Registered Training Organisation, GTNT Training Plus seeks to maintain the highest standards of competency-based training that is effectively targeted at building individual and organisational capability. 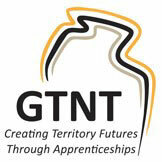 GTNT Training Plus programs will include training and assessment for formal qualifications in addition to short skills development courses that lead to a statement of attainment for the competencies involved. Participants entering these programs may obtain advanced standing for previous relevant experience and study using the GTNT Training Plus recognition process. As part of the GTNT Training Plus commitment to the delivery of quality training this Handbook is designed to provide accurate information to participants about the program that it offers as well as the rights and responsibilities of GTNT Training Plus and its participants. There are no specific entry requirements for this qualification. However, students will need to have the appropriate language, literacy and numeracy skills. Participants are to be working in a full time or part time capacity and have a requirement under the current National Quality Framework for Early Childhood Education and Care to be working towards a qualification. Participants are new to the workforce and wishing to enter the Early Years Sector. Everyone employed or volunteering in child related work is required to hold an OCHRE card. Applicants must be 18 years of age or above at the time of course induction. preferably don’t already have a Certificate III level qualification or above. For those students not eligible for funding full course fees at $5500 will be payable. For those students not eligible for funding, full course fees at $9000 will be payable. 1300 66 11 64 or contact us for more information using the form below. Your Inquiry * -- Please Select One --I'm enrolling and have attached my Enrolment Form.I'm enrolling, have attached my Enrolment Form and maybe eligible for User Choice FundingI'm looking to enrol in a course and would like more information.I'm an employer and I'd like to register my interest. **Please note, you may be eligible for a government subsidy if you live or work in NT only.